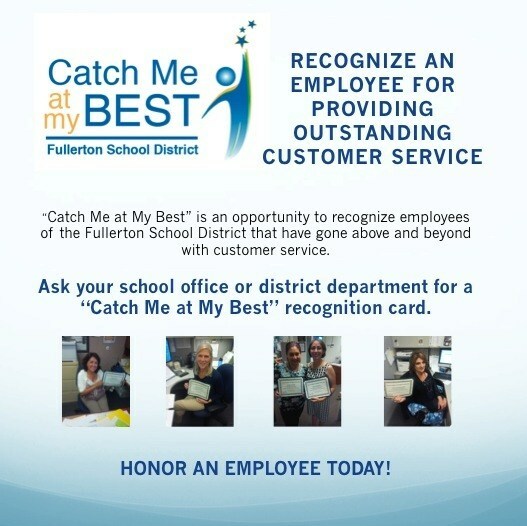 “Catch Me at My Best” is an opportunity to recognize employees of the Fullerton School District that have gone above and beyond with customer service. School offices and district departments have “Catch Me at My Best” recognition cards available for students, parents, and fellow staff members to fill out, and the cards can be turned in to school administrators or department managers. The FSD Customer Service Team along with the Board of Trustees will review each card and evaluate the employee by speaking with their colleagues and immediate supervisor. When an employee is chosen for a spotlight customer service recognition and award, we will also honor them at General Management Meeting and the monthly Board meeting with a special certificate.